May | 2009 | Great Auk - or Greatest Auk? Waaaaaaaaaay back on April 1, I got a text message from my brother Brian, he of the otters eating herons. In this missive, he announced that there was a black bear wandering around the Olde Homestead, just behind where the barn used to be when the barn used to be there. But what’s this? Barely (haha) two months later, not one but two young bears have fallen into the hands of the authorities just a slender county over, having gotten themselves run over on Erie County’s copious and mostly unnecessary highways. A home-grown account may be found here. So, what’s going on? Did Bri, in some twisted ursine perversion of the Prosperity Gospel, name the bear and inadvertently claim it? I doubt it. We’re not a magical family, by and large. So what’s up? Bear baby boomlet? Some ecological disruption to the north forcing bears to roam in search of new habitat? Or sheer coincidence? The DEC notes that black bears are prone to roam, and the population in New York State may be up to 7,000, so coincidence cannot be ruled out. But if not, Brian has a lot to answer for. My May continues to disappoint, but I did get my first of season Red-eyed Vireos this week. Perhaps it is just as well, or at least no harm. After all, everyone knew what the last most common bird of the eastern woods looked like – and how it tasted, too, until there weren’t any more of them. But it’s sometimes disconcerting to consider how different my mental landscape is from the millions of people who walk around every day with Red-eyed Vireos overhead, all unknowing. A University of Florida study has demonstrated that Northern Mockingbirds can distinguish individual humans and respond to them based on whether they’ve previously been threatened by that specific human. In the study, grad students who poked at Mockingbird nests on consecutive days were subsequently hassled by the parent Mockingbirds, while grad students who had not poked the nest were allowed to approach much closer without being dive-bombed, shrieked at, or otherwise subjected to Mockingbird ire. This is a remarkable ability for a bird with a brain maybe the size of a large honey-roasted cashew, and the researchers speculate that it may have contributed to the Mockingbird’s success in colonizing urban and suburban landscapes. Understanding which factors lead to the success of urban-dwelling birds is not only nifty in its own right, it can potentially offer clues on how to make urban and suburban habitats more congenial to less flexible species. It’s a fascinating study, and the more I think about it, the more questions it raises. How do the mockingbirds do it? The grad students wore different clothes on different days of the experiment, so it’s not based on “plumage”. Either the birds can recognize distinct human faces/hair colors, etc., or it’s something more subtle, like gait or the timbre of the individual voice (Mockingbirds are, after all, quite good at noticing and remembering sounds). And why? Has urbanization been around long enough to be a major selective pressure on Mockingbirds? Or is this a pre-existing trait now being adapted to a novel environment? And if so, what was it used for before people, with their puzzling propensity to poke nests, came along? It seems to me that once most predators know where your nest is, there’s not much left to defend for next time, so it’s better to go after all of them, not just memorable individuals – but I’m not a Mockingbird, so I could be wrong. Maybe preemptive aggression towards predators that don’t already know where the nest is only tips them off that there’s something interesting in the neighborhood. Or perhaps this behavior drives away clumsy herbivores that might disturb or expose, not devour, the nest – say by preventing the local deer from making a particular shrub a regular snack-bar stop. In that case, it would be a waste of resources to hassle a deer that was just passing through. Obviously, all this is just speculation and much further study is needed, which just goes to show that even common birds are worth careful observation. After all, it appears that they’re carefully observing us! No matter what the cause, my trip to Central Park this weekend yielded little but dampness and disappointment. When it started raining minutes after I reached the park, I knew there wasn’t much hope. And when Strawberry Fields yielded nothing but a female Black-throated Blue Warbler, a singing House Wren, and a bunch of irritable Robins, what hope there was faded. But by the time I came out the other side of the Ramble and found myself profoundly grateful to see a Common Yellowthroat, I decided that it was time to pack it in and go down to the 9th Avenue Food Festival instead. The next day was even less birdy… and yet. As the Inimitable Todd and I strolled up Bedford Avenue in pursuit of vintage clothes and beer, I spotted not one, not two, but four House Sparrows engaged in midair pursuit of a yellow butterfly (some kind of Sulfur, I think.) Now, I know very well that in addition to their profligate breeding, one of the keys of House Sparrow success is that they’ll eat anything that will fit down their throats. But I’d never seen one engage in fly-catching before. And they could use more practice, judging by what I saw yesterday, since the butterfly successfully evaded all four of them and flew away. Perhaps this coming week will be better. This week I saw another inevitable sign of spring; a dead, naked House Sparrow chick, tumbled from an ill-placed or ill-made nest to lie on the sidewalk looking pink and vulnerable. From now until it gets too late for the adult birds to attempt another brood, these will be a regular feature of life for those who look down, along with a smaller number of prematurely fledged robins and pigeons and the occasional smashed egg. Call it the dark side of all the activity I saw last week. But dark is not the same as bad. It’s not good, either (unless you’re a small scavenger) but it is necessary, by the nature of the world system. Evolution doesn’t function right without it, nor do the assorted calories and nutrients keep cycling if you don’t have death. And when you’re talking about House Sparrows, well, another one will be along, and another, and another (at least here in New York. In their native habitat, things aren’t going quite so well). Still, it’s the end for that sparrow. Also this week, Condor 286 died. 286 was known as Pinns by some of the researchers on the California Condor project, having been one of the pioneer condors released over Pinnacles National Monument. He mentored other young condors there before being transferred to Big Sur. He was one of the senior birds of the reintroduction effort – and yet, given that he was not one of the original birds captured from the wild in 1987, he cannot have been more than 21 and probably significantly younger. Condors can have a lifespan of up to 50 years, but 286 died a bullet-riddled, lead-poisoned veteran before he was even old enough to buy a beer. If condors drank beer. Condors are not quite like sparrows. Another one will not be along in a minute. There are currently just over 300 California Condors in the world; it would take me no trouble at all to see 300 House Sparrows in one day in Brooklyn. House Sparrows reach breeding age at a year and scatter young hither and yon, hoping that some of them will stick, classic r-strategists. Condors take six or seven years before their thoughts lightly turn to wooing, and then they raise one chick a year – they may lay a second egg if the first is lost but condors are only children by tradition and necessity. Parents take a great deal of care of this one chick, teach it what it needs to know, and if they succeed – which of course, very often they do no, even among the most dedicated K-strategists – it has few natural enemies and can expect a long life. Of course, if one of those natural enemies is humanity, all bets are off. 286 had fifteen shotgun pellets in his body, the result of human malice, and he also carried a load of ingested lead, the result of human heedlessness. Of the two, it was the heedlessness that actually killed him, but it could just as easily have been the other. Even a strongly K-leaning species like the condor should be able to absorb the loss of one individual, but human heedlessness and malice have already killed so many of 286’s relatives that our eye must be on every single individual if they are to survive as a species. In a way, this is a profoundly unnatural situation. But right now, it is the only way. Migration gets most of the press, but from the actual bird’s perspective, breeding is the main event. The hustle and bustle of spring is in aim of reproduction. All the singing, the bright new plumage, the travel and tribulations, they are all ultimately just for getting some DNA from an existing bird into a brand new bird. It’s sort of like a giant sand painting moving four-dimensionally. Except when it’s not. Mother’s Day seemed like a good time to check up on how all that’s going. So I headed down to my usual stomping grounds at Prospect Park to have a look around. Less fortunate were the Mourning Doves. I had spotted two nests in my previous rambles this spring, one under construction and one being incubated. This trip found both of them gone. Perhaps the week’s persistent rainstorms knocked them down. The birds who wintered warmly, on the other hand, are still catching up with the demands of staking out territory and building a nest. My favorite observation of the day was a Green Heron gathering twigs in the Lullwater as I watched for several minutes. S/he was being very picky, trying this branch and that branch, not succeeding in getting many to break off at the length desired. You can’t help but be impressed by the amount of effort expended for a very uncertain reward, year after year down countless generations. The Baltimore Orioles have, if anything, even more intricate nest-building work to do, but the ones I saw were chiefly occupied with sitting in the canopy yelling challenges and insults at each other in melodic form. Likewise, the Yellow-rumped Warblers were still ubiquitous and very vocal, although many of them have a long way to go before they’re on their breeding territories. The recently-arrived American Redstarts, both male and female, were also singing even though they won’t breed in Prospect Park as far as anyone knows. The single Blackpoll and abundant Black-and-white, the Black-throated Blue, the (not yet very vocal) Ovenbirds and the skulking Common Yellowthroats – they’ll all head for points north before they get down to business, preferring to raise their kids in a quieter neighborhood. Some of the Eastern Kingbirds that arrived en masse this week might stick around, though, and so might the Warbling Vireo. Less than fifty species of bird are actually confirmed to breed in Prospect Park. This year a new breeding bird survey is taking place, under the auspices of the New York City Audubon Society: information can be found here. 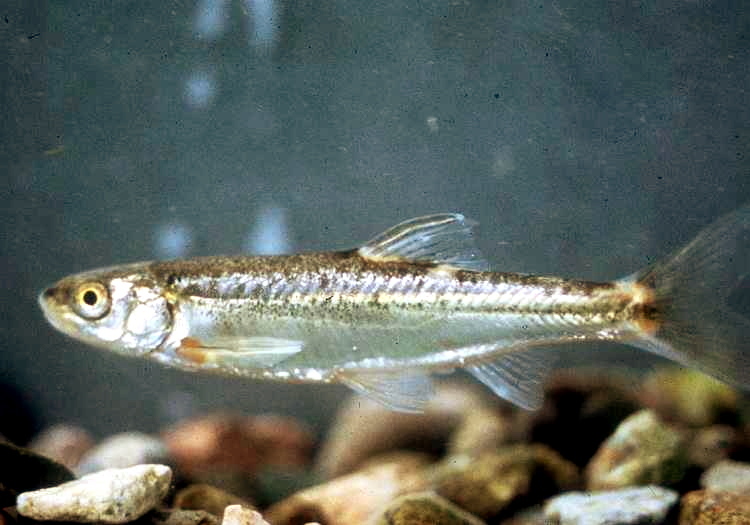 The New Mexico Cattle Grower’s Association and a coalition of county governments from New Mexico and Arizona recently sued the Fish and Wildlife Service, claiming that FWS overstepped its bounds in setting aside critical habitat for the spikedace and loach minnow, two threatened piscines. Not content at first eliminating the critters from 80% of their historic range, nor even at getting the critical habitat designation reduced from 900 miles to 500 miles of river, these cowboys wished to beat the tiny fish back even further, and suspend all habitat protection. Apparently humans just aren’t sucking enough water out of the southwest for inefficient and over-subsidized agricultural purposes yet. But in one of those classic moments that old Aesop would have loved, the Center for Biological Diversity countersued and yesterday judge John Conway instead ruled that the habitat designation was probably not expansive enough, and had most likely been tainted by pressure from disgraced deputy assistant Interior secretary Julie MacDonald (who was forced to resign back in 2007 after her little habit of overriding scientist recommendations in order to produce decisions more amenable to her political overlords and their economic overlords came to light.) The current protections for the spikedace and loach minnow will remain in place while the Fish and Wildlife Service studies what more should be done. I believe the appropriate phrase, in the parlance of our times, is “Ha-ha”.